Donate today to keep Global Voices strong! Our global community of volunteers work hard every day to bring you the world's underreported stories -- but we can't do it without your help. Support our editors, technology, and advocacy campaigns with a donation to Global Voices! Illustration mashup created by Eddie Avila, utilizing the bird icon by Sara Novovitch, ES at the Noun Project, the voluta by Jer Clarke, and the Word It Out word cloud program. 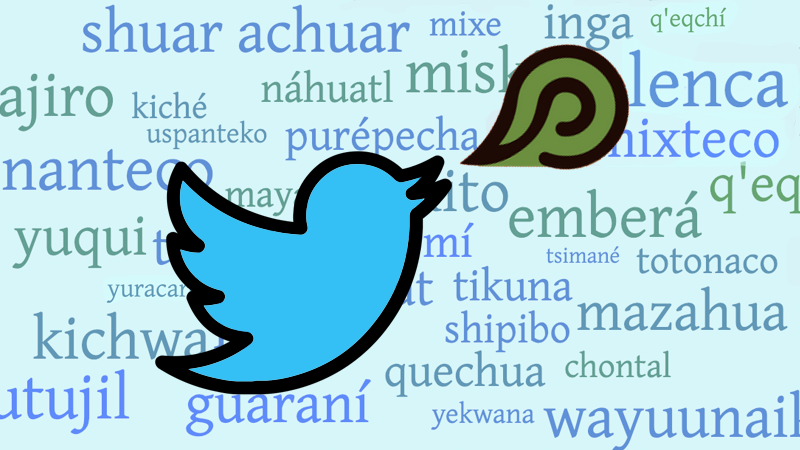 Starting on Monday, January 14, a rotating roster of indigenous language digital activists from Latin America will take control of the @ActLenguas (Language Activism) Twitter account. Coordinated by Rising Voices, this social media campaign is taking place within the context of the International Year of Indigenous Languages 2019 and will provide a space for diverse voices from across the region to tell stories of their experiences with language revitalization. Over the next 50 weeks, 50 different activists will take turns sharing their perspectives on what their native language means to them and their communities. These activists are all working to promoting the use of their languages in new domains like the internet, which presents many opportunities and challenges. But there is also an important offline component to their activism related to long-standing histories and contemporary contexts that affect the vitality of indigenous languages. For the past five years, Rising Voices (RV) has been facilitating digital activism by helping to organize gatherings and workshops and providing microgrant funding and support to projects in the region. RV also highlights innovative digital initiative on our mapping website, but we feel that this campaign is especially important because those following along on Twitter will hear directly from the activists themselves. Response to calls for participation has been extremely positive, as the roster for the first round through the beginning of May has already been filled. We opened the roster first to people who have taken part in one of the regional gatherings, microgrant programs, or other Rising Voices activities. Our first host is Yásnaya Elena Aguilar Gil, a Mixe from the state of Oaxaca. Read more about her in this profile published on RV. Yásnaya, along with and her colleague Tajëëw Díaz-Robles, who'll be hosting later in the year, were some of the architects of the concept of “digital activism” as a strategy to promote languages and attract new speakers. While technology and the internet will not magically solve the serious problem of language loss, it can play an important role in a comprehensive strategy of language revitalization. In October 2014, when the two women were working with the Juan de Córdova Library in Oaxaca, they partnered with Rising Voices on the first-ever national gathering of indigenous language digital activists that brought together more than 30 people from across Mexico for three days of peer learning and exchange. Created out of this meeting was a local network for mutual support and encouragement. Many of the people that participated in that first event are on the hosting roster for the @ActLenguas social media campaign. After that meeting, national networks formed in countries such as Bolivia, Peru, Colombia, as well as local projects focusing on one language or a few languages in a specific area. People from these projects and networks are also well represented in this year-long campaign. Their personal stories, hard work and dedication lie at the heart of these networks. These activists are eager to share these stories with people who may know very little about indigenous languages in Latin America, as well as with other indigenous communities and activists who will see in these stories echoes of their own experiences but also learn about other parts of Latin America and their unique contexts. This is just a sampling of some of people at the center of this campaign to share stories of critical language-related work happening across Latin America. Visit the campaign page to see the current schedule, and stay tuned for short blog posts with profiles of each host. This social media project was inspired by initiatives such as @IndigenousX in Australia, whose founder, Luke Pearson, provided important guidance in the planning stages. Global Voices’ own Instagram account is also managed by a rotating roster of community members and has been an excellent way to gain insights our diverse membership and the places where they live. While the tweets will primarily be in Spanish and the native languages being highlighted, we are exploring ways to curate and translate key messages to further amplify these stories. You can support this campaign by following the @ActLenguas account throughout 2019, and by retweeting messages you find inspiring of interesting. Hosts are also eager for feedback and will do their best to respond.